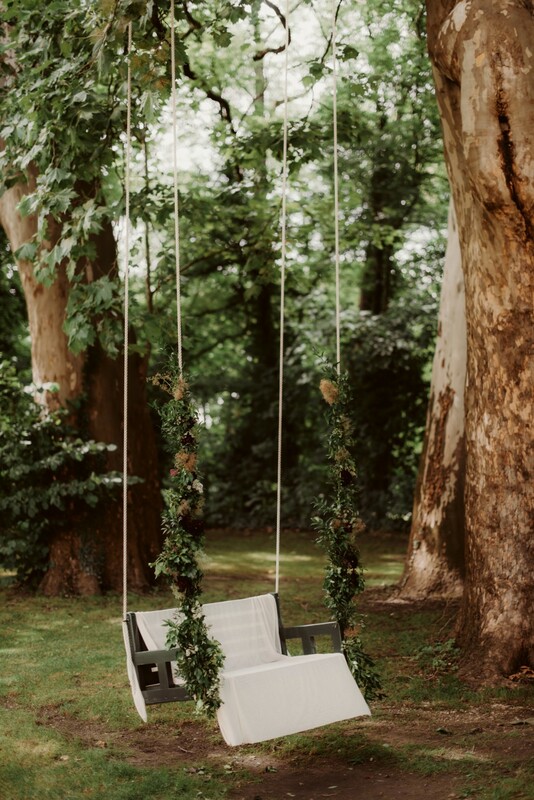 Not an easy year in terms of blogging here at High Emotion Weddings, as we’ve been busy bees planning, designing and coordinating some breathtaking destination weddings, elopements and marriage proposals in Austria and kicking off our French operations. And the season isn’t even over yet, but as I’m finally taking some time to visit family (Irene here), I love using airport and flight time to rethink and restructure past and future events. 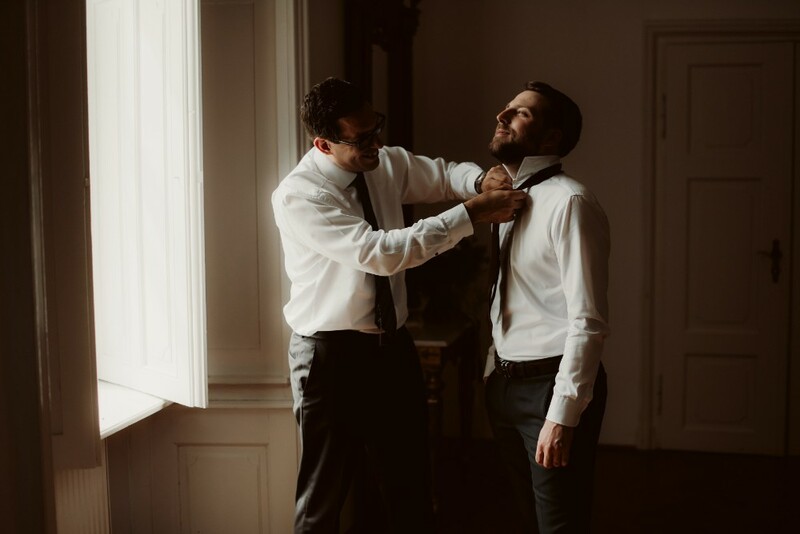 When we got the amazing news of Sabrina and Mathias’ wedding being published on Junebug Weddings, we were in the middle of coordinating two super cute elopements in the Austrian Alps, so we kind of had to happy-dance on silent mode and we still need to pop a champagne soon to celebrate. 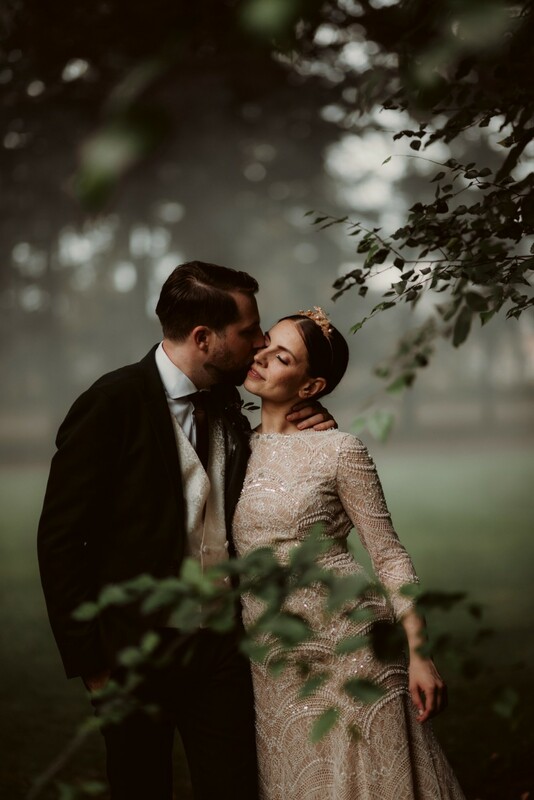 When I first met Sabrina and Mathias, I immediately knew it was going to be a totally different wedding than what we had created up to that point. 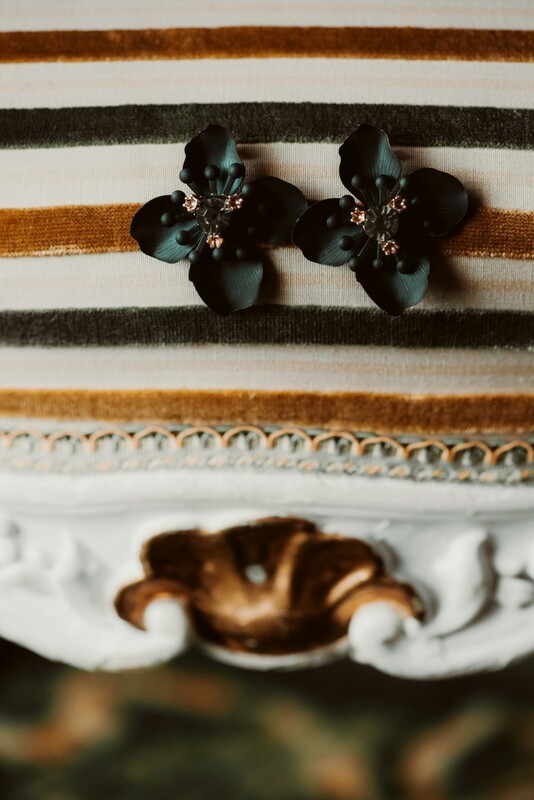 And oh do we love a good challenge and the thought of a totally new wedding design concept – we can even say… this one was the exact opposite of existing wedding trends. Sabrina was very specific about what she didn’t want to have at her wedding: no pastels and no roses. And also very specific about her must-haves – she gave me a clear YES to: white anemones, florals in the colour of wine-stained lips (this totally created a complete image in my mind, the moment I heard the idea 😊), a super natural ceremony setting by the pond in the castle gardens, black stationery with an old-world feel and golden wax seals, fancy cocktails, a juicy wedding cake, good food and a full dancefloor until dawn. 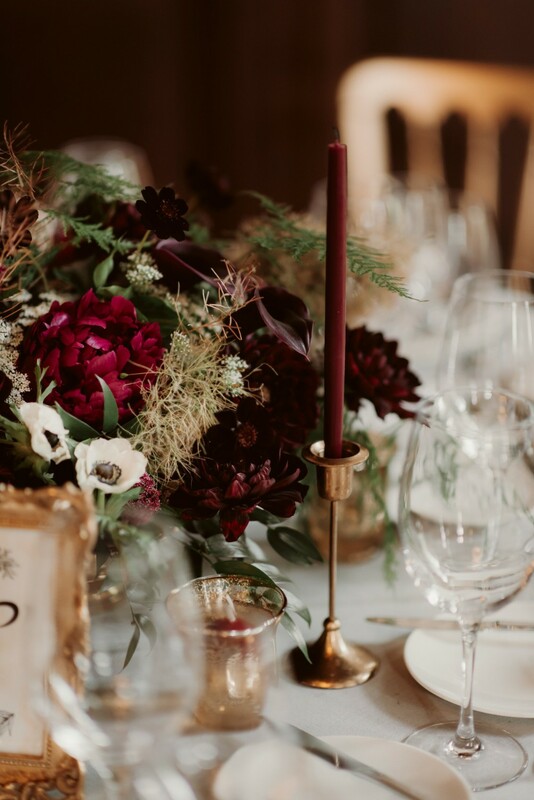 And they couldn’t have chosen a better photography team – the dark and moody style of Dana and George at Land of White Deer was the perfect match to the overall wedding design concept. 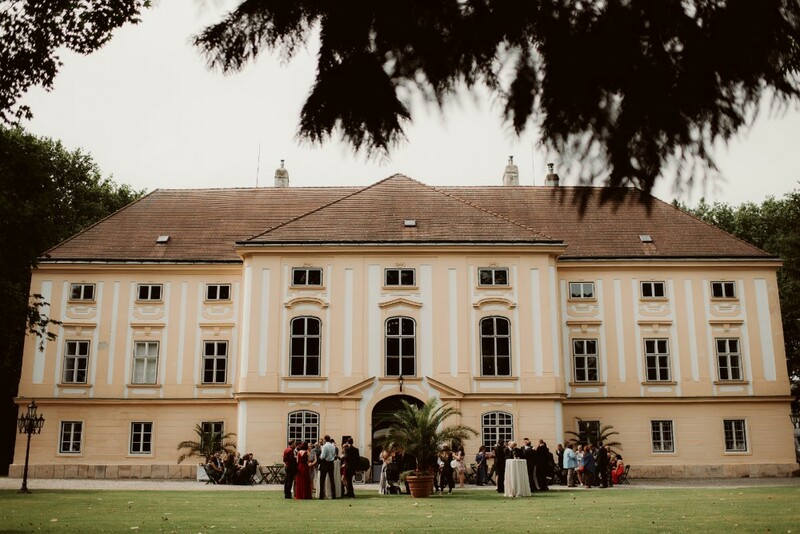 Even though the central feel of the wedding was that of a relaxed summer night’s party, it was very important to Sabrina and Mathias to incorporate some luxurious old-world elements, to show guests coming from abroad a bit of the Viennese imperial charm, and of course, to celebrate in style. 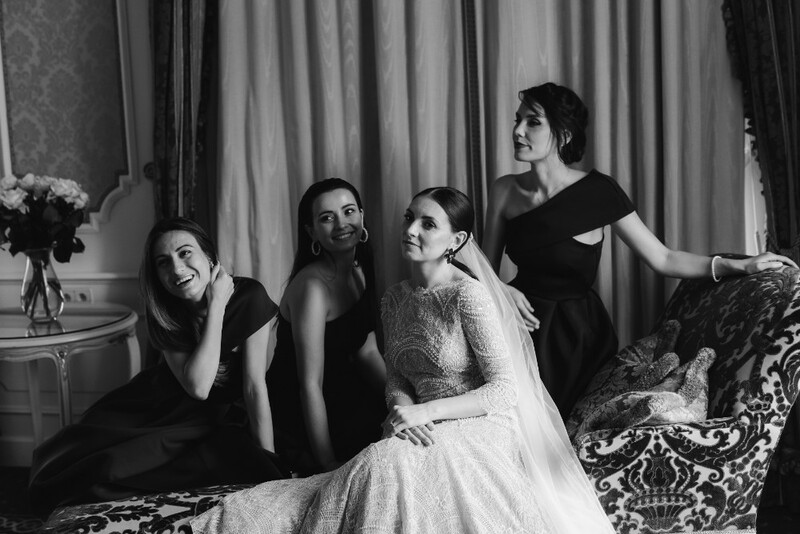 So, the obvious choice was an elegant start into the day for the bride and her bridesmaids, getting ready in a beautiful gold and green suite at Hotel Imperial Vienna. 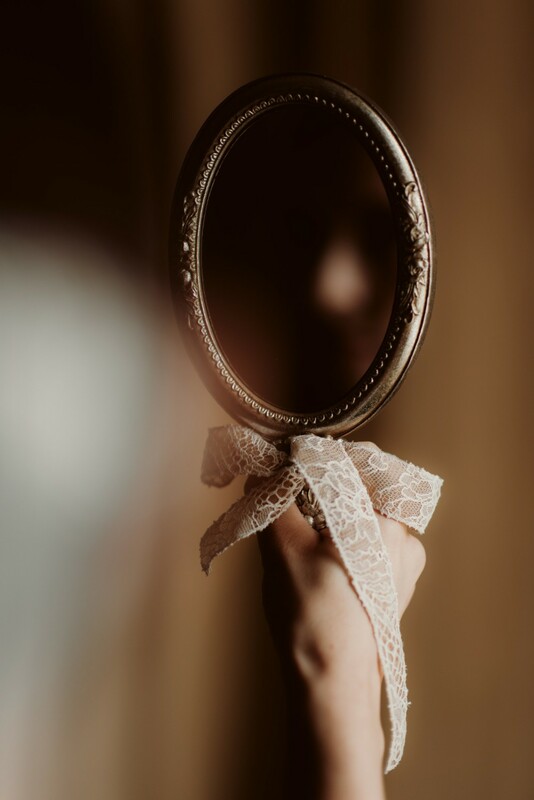 While we were setting up dining tables in the ballroom of the castle, Sabrina was getting a glamourous hairstyling and make-up by Adriana Holban, and enjoying a super fun morning-of with her three beautiful ladies and dear mom. 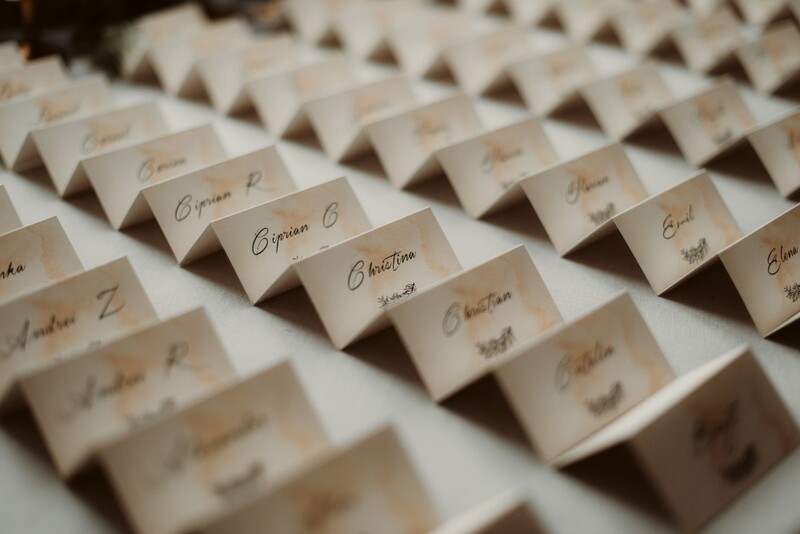 She also picked stunning burgundy-purple one-shoulder bridesmaids dresses that matched the overall palette perfectly. 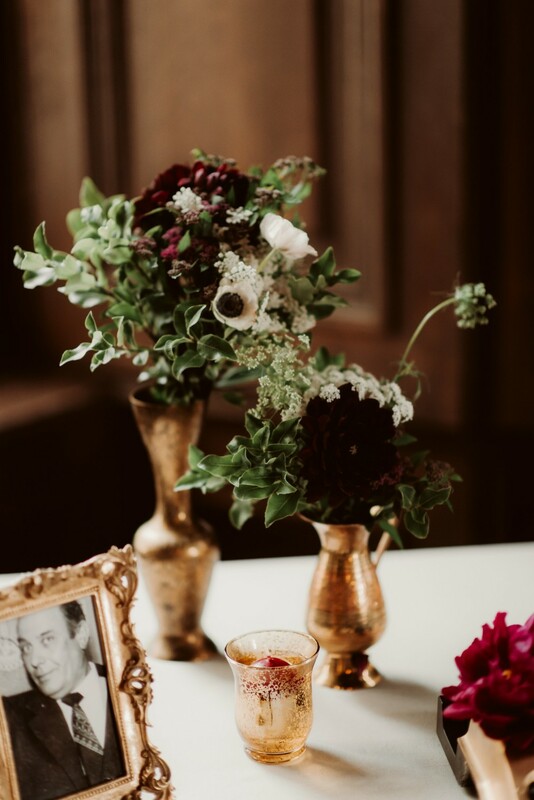 Hana, from Ponk Rentals, did her magic in complementing their beauty with unique corsages made of burgundy dahlias. 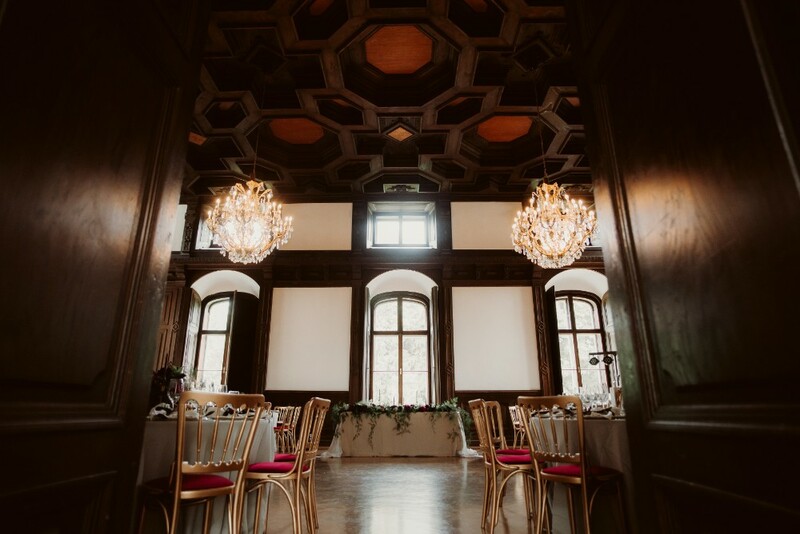 Meanwhile, at Schloss Margarethen am Moos, Cristina, Mihai and I were transforming the ballroom of the castle into an elegant dining room, reflecting the couple’s personalities and wishes – together with the amazing styling team at Ponk Rentals and the catering team at Trabitsch, we managed to create the exact atmosphere the bride and groom wanted for their Austrian wedding: dark and moody, full of contrasts and statement elements. 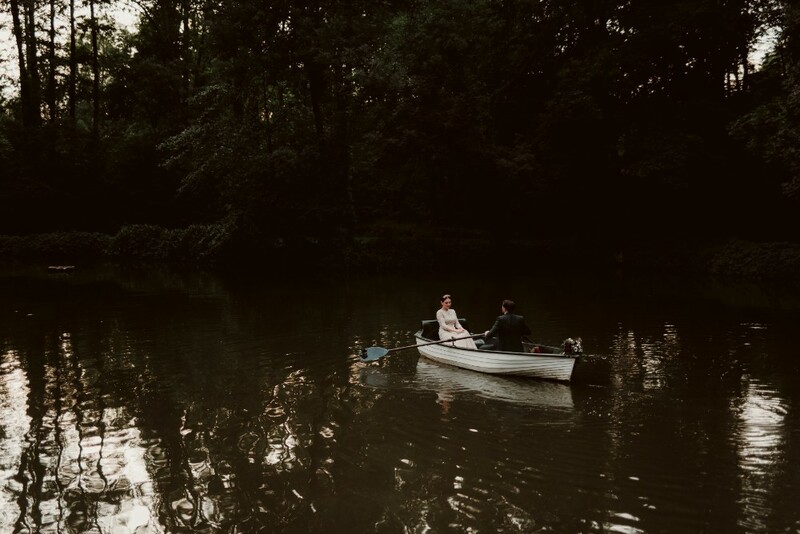 We knew the day was going to be perfect when the skies cleared out and we decided to set up the civil ceremony outdoor, by the pond in the castle park, just like the couple had hoped for. 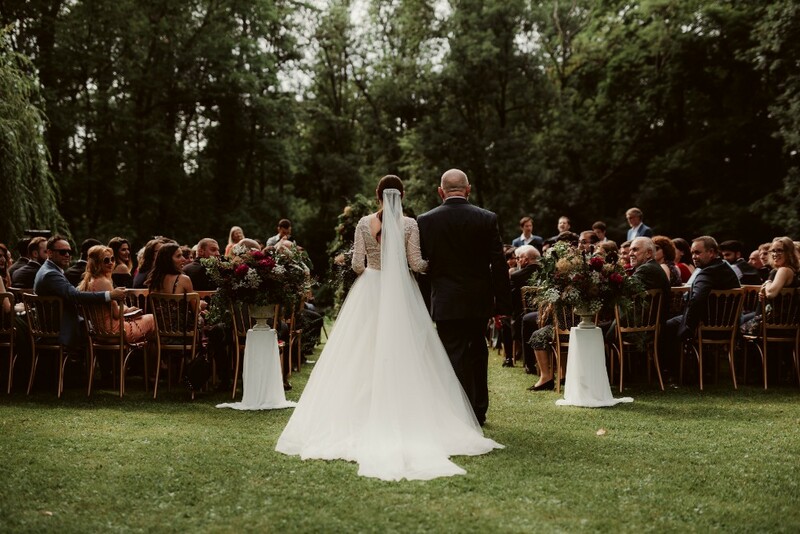 So, their guests enjoyed a perfect afternoon, witnessing Sabrina and Mathias’ I DO’s and custom cocktails (created especially for the bride and groom) at perfect temperatures. 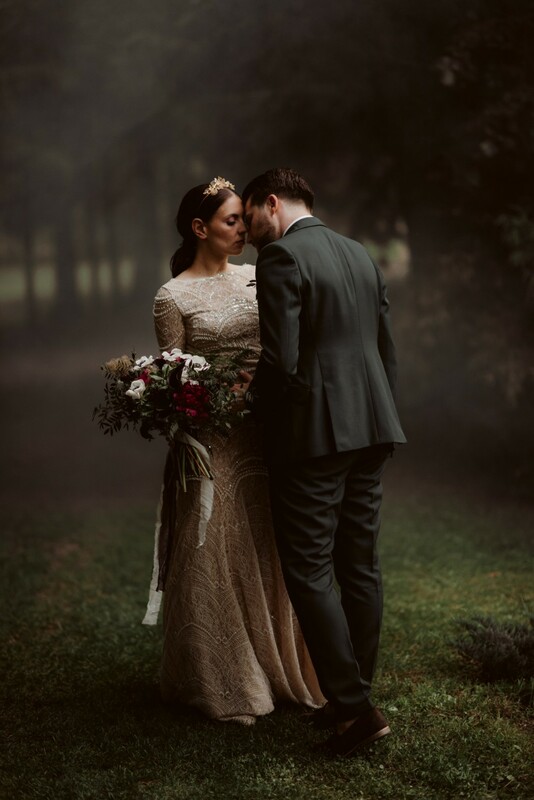 Needless to say that Sabrina’s appearance in her champagne coloured, fully beaded dress by Ersa Atelier was the wow effect of the wedding ceremony. 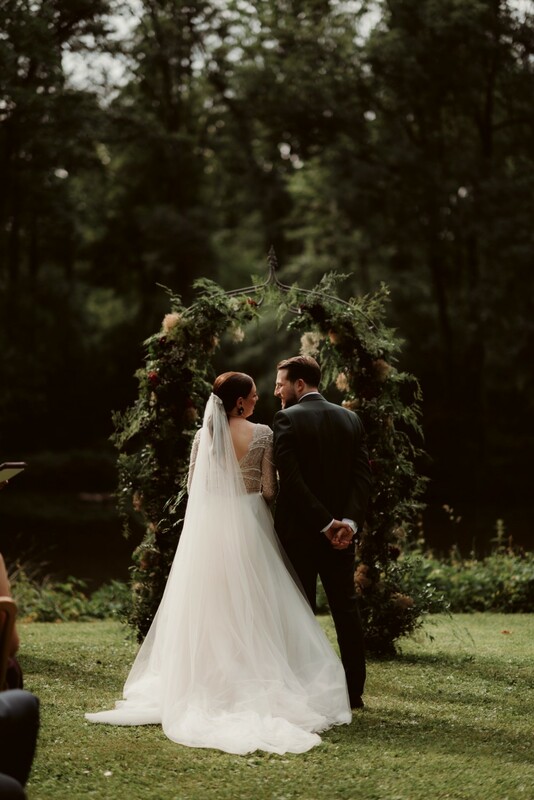 It was a 2-in-1 dress, with a tulle overlay and a killer veil, which along with her black calla and white anemones bouquet, gave her the perfect statement look of a goddess walking down the aisle. 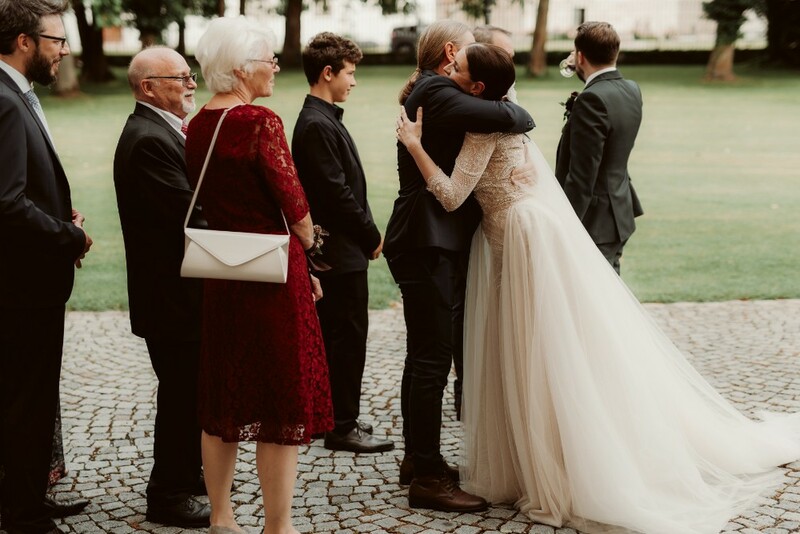 Mathias wore a unique dark green custom suit by Kuhn Maßkonfektion, which rounded up the overall wedding theme. The wedding timeline was also atypical, since the couple wanted to use every second to have fun on the dance floor. 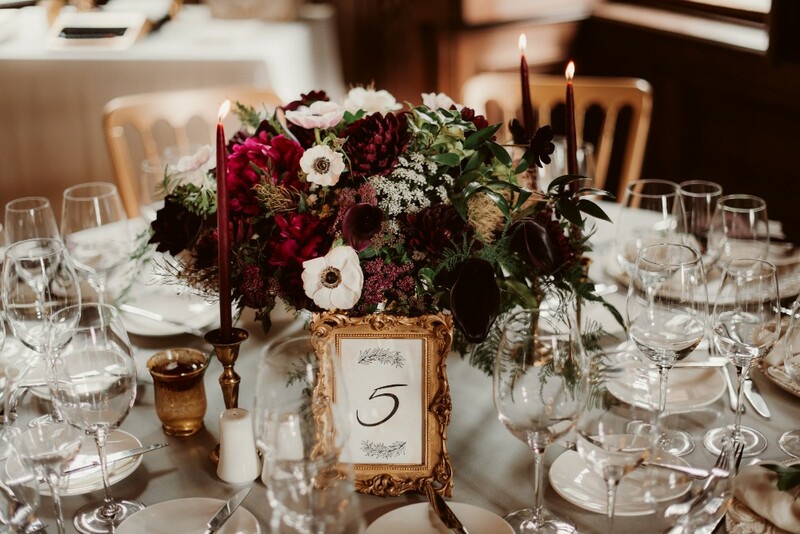 So, as soon as we entered the ballroom, they opened the dance floor with their first dance as husband and wife – a very dramatic choreography which made the elegance of our bride shine again in the spotlight. Some other highlights of the evening included a Dirndl – the traditional Austrian costume for ladies, as a symbol of Sabrina embracing the culture of her new family – and of course the cake cutting at midnight.